â€œIn Ukraine, the evidence is still that policymakers do not quite understand the seriousness of the challenges they face,â€. Timothy Ash, analyst at the Royal Bank of Scotland. Make no mistake about it. What is taking place right now in Ukraine is extraordinarily serious. The IMF have recently agreed a support loan to the country, but the politicians themselves still can’t agree on whether or not they are actually going to abide by the conditions attached to it. Meantime, as we can all see on our TV screens, tensions with Russia continue to escalate, fuelled by the conflict-ridden negotiations over Ukraine’s gas debt. 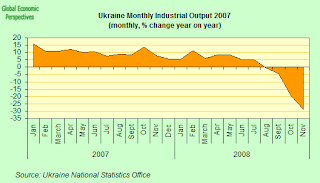 And just to add to the nighmare, Ukrain’s economy made a dramatic entry into recession in Q4 2008. In fact, so severe has been the slowdown that nobody at this point can even muster enthusiasm for opening up one of those interminable discussions about whether or not what the country is going through really counts as a “technical recession” (in terms of two successive quarters of GDP contraction) or not, since the drop in national output has been enormous, and it it fairly obvious that isn’t about to come bouncing back up again. At least not for the next several quarters it isn’t, and – to give us an early glimpse of the terrain onto which we are now entering – the World Bank have just forecast a 4% contraction in GDP for 2009. Ukraineâ€™s government – which is laways a chaotic process at the best of times – is once more having a serious identity crisis about who it is and what it wants to do, with one of the exectutive’s two visible hydra’s heads (Prime Minister Yulia Timoshenko) seeking to respond by manipulating the currency downwards, by boosting social expenditure to an extent which will push next yearâ€™s budget deficit up to 2.96 percent of gross domestic product (from an agreed 1.4%) and well beyond the IMF pact level, and by attempting to resolve the trade deficit problem by imposing an administrative tax on imports. The other head of the hydra (President Viktor Yushchenko) is busy opposing all these moves on the grounds that they may jeopardize the second tranche of a $16.4 billion loan from the International Monetary Fund, and obviously, were this to be the case, the country would basically find itself bankrupt, and at the mercy of whatever sentiments the global financial markets wish to express when it comes to Ukraine. Of course regular readers of this blog will not be surprised to find that this politically split personality crisis goes right into the heart of the central bank (see my Monetary Chaos Breaks Out At the Ukraine Central Bank post) and no one will be really that surprised to find that the two key characters in this round of the saga are (yet one more time, read the linked post, its all explained there) National Bank of Ukraine Governor (and board chairman) Volodymyr Stelmakhâ€™s and Petro Poroshenko head of the central bank council. Well things are really hotting up at the moment, with Viktor Yushchenko this week threatening to fire some central bank employees (presumeably those who were not implementing the decision to allow the Hryvnia to float), while Yulia Timoshenko was busy demanding the dismissal of National Bank Volodymyr Stelmakh himself – presumeably because he was trying to stop further currency intervention. 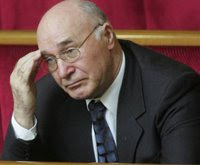 In an official statement the central bank council responded by accusing Timoshenko of stirring up â€œchaosâ€ and undermining the nationâ€™s banking system, while Timoshenko, for her part has now taken the matter to the Ukrainian parliament (the Verkhovna Rada – where she may well carry a majority) which will now hold a full debate the role of the central bank next week. It seems not to matter too much here that the bank council is simply trying trying to implement a set of policies which were agreed to (or everyone thought they were agreed to) as part of the IMF loan agreement. (Interfax-Ukraine) – Yulia Tymoshenko Bloc has proposed that, based on results of a report by an ad hoc parliamentary commission scrutinizing the National Bank of Ukraine’s activities, an address should be sent to the Prosecutor General’s Office and that National Bank Chairman Volodymyr Stelmakh should be arrested. “I think that, based on the report’s findings, there will surely be an address to the Prosecutor General’s Office of Ukraine and other law enforcement agencies, which, by the way, are already conducting inquiries,” Volodymyr Pylypenko of the Yulia Tymoshenko Bloc said in an interview with Interfax on Wednesday. “The best gift in this situation can only be an order on taking [National Bank of Ukraine Chairman Stelmakh] into custody for all wrongdoings the National Bank has committed in the past months,” Pylypenko said. President Yushchenko did express the hope last Tuesday that Ukraine’s currency market might be moving rightside up, with the hryvnia trading at about 7.8-8.0 to the dollar and level of “stabilising” dollar purchases by the central bankdeclining, but Prime Minister Tymoshenko remained unconvinced that this was a desireable level, and demanded more concerted intervention to move the currency up to a much higher level – around the 6-6.5 to the $ mark. She gave Yushchenko a week-and-a-half apparently, since otherwise she stated the country would face increasing problems with inflation, and in the banking and other sectors. It is not clear (at least to me) why these problems (which are, and will continue to be, serious) should suddenly deteriorate within the time scale of ten days, but presumeably there was another, more political, message behind this choice of words. Adding to the confusion, Ukraine’s parliament, has decided to impose an additional 13% temporary duty on all imported goods – and this despite the fact that Ukraine only recently entered the WTO. A total of 269 MPs from the ruling coalition and the Communist Party voted for the relevant law which amended existing Ukranian lefislation – with, it was said, the aim of improving the state of Ukraine’s balance of payments. “Duties have been increased on all imported goods, apart from a [so-called] ‘critical’ [list of goods],” the head of the parliament’s committee for tax and customs policies, Serhiy Teriokhin, is quoted as saying. “I’m alarmed by the report of my legal department on parliament’s decision to impose an additional temporary duty on all imported goods. Parliament’s decision puts Ukraine’s presence in international programs in jeopardy,” President Yushchenko said at a press conference yesterday. “Similar decisions by Russia and Europe might be made against us in three days,”. Last month, a point in time which now seems so distant it feels like eternity, Ukraine received approval for a two-year IMF loan intended to help support its banking system and cover the countryâ€™s widening current-account gap during what was always seen as being a difficult adjustment process. Under the terms of its agreement with the IMF, Ukraine is expected to have a balanced budget next year. If the Cabinet fails to meet the target, then the Fund may withhold the second tranche of the loan, according to press statements by Balazs Horvath, IMF representative in Kiev. Ukraine received the first installment of $4.5 billion last month, and is due to get the second tranche in February. Obviously the IMF is by now well accustomed to playing the part of the “bad boy” in this type of situation, but what if the country they are trying to deal with should simply “implode”, right in its face, I’m not sure even the hardened hand of the IMF are ready for this. So let’s just hope I’m exaggerating, and that it won’t happen (fingers tightly crossed everyone, please). So Ukraine faces a crisis on three fronts, financial, economic and political. On the real economy side, the Ukraine cabinet currently expects growth in the countryâ€™s economy to slow to 0.4 percent next year, compared with a final rate which turn out to be somewhere between 1.8 percent and 2.5 percent this year. As I say the World Bank now expects a 4% contraction in GDP next year, and thus a 0.4% expansion in the budget is potentially a very serious problem indeed for the deficit, if the economy underperforms, as it surely will. The Hyrvnia has been falling for a number of weeks, but the rate of decline has really accelerated in the last ten days, and we are really now talking about one of those famous currency crises. The national currency has fallen 50 percent against the dollar since June, and according to Michael Ganske, head of emerging markets in London for Commerzbank, it may well drop another 24 percent in the next few weeks given market sentiment and that the International Monetary Fund package effectively limits central bank intervention to halt the slide. 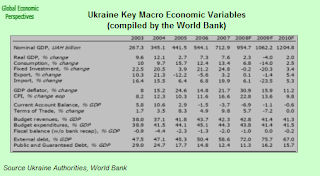 The terms of the IMF $16.4 billion bailout package, agreed to last month, require Ukraine to move toward a flexible exchange rate and place a maximum limit of 4 percent for any reserves reduction during the remainder of 2008 (from the base of around $32.8 billion). Thus while the agreement does allow intervention to stem â€œdisorderlyâ€ swings, it places a tight limit on what this means. And this now is just the problem, although before we jump to our guns, we should bear in mind that what is provoking the fall is not the IMF and the bailout, but confidence in the ability of the political system to implement a workable recovery plan. Trying to run a currency corridor, and accepting the inflation that went with it, is how we got here in the first place. 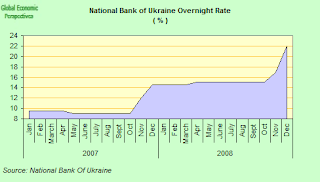 The only real remedy Ukraineâ€™s central bank has at its disposal at this point is to raise its base refinancing rate, and this it duly did last week, taking it up from 18 percent to 22 percent in an attempt to arrest the hryvniaâ€™s decline To give us some idea where we are at this point, at the start of 2008 the dollar bought 5.04 hryvnia, while right now it can purchase around 8.25 hryvnia. Ukraineâ€™s stocks have also been falling, and the benchmark PFTS stock index is down 74 percent this year, the third-steepest decline among the 22 so-called frontier markets tracked by MSCI Barra. Mariupolsky Metallurgical Plant, Ukraineâ€™s largest steel company by revenue, has fallen 92 percent on the Kiev stock market. On the other hand the extra yield investors demand to own Ukrainian government bonds instead of U.S. Treasuries has increased more than nine times this year to 25.86 percentage points, according to JPMorgan Chaseâ€™s EMBI+ indexes, which compares with an average three-fold increase in the main emerging-market index to 7.09 percentage points. Aggressive lending by banks that borrowed heavily from abroad has obviously contributed to Ukraineâ€™s ballooning private sector external debt (currently estimated at $85 billion). Official figures indicate that only some 2.5 percent of loans are currently problematic, but this situation is obviously about to worsen considerably next year as the currency is down and the economy contracting. Earlier this month, Finance Minister Victor Pynzenyk called on banks to refinance loans amid a weakening hryvnia and rising interest rates. Some banks in recent days said they would seek compromises with clients, rather than hike interest rates further. Pynzenykâ€™s proposal called on the NBU to amend its rules to allow borrowers either partially or in whole to pay back loans in the national currency at the exchange rate which was operative when the loan agreement was signed. The banks, in turn, would be allowed to lower their capital/asset ratios and write off their losses, thus paying lower taxes, which would also require amendments to the tax legislation. Obviously some such solution will need to be found for this problem. (There has already been some move in this direction in Hungary, another of the countries which is strongly affected by the forex loans problem). Other measures under consideration at the present time include extending loan periods, and the temporary reductions in loan payment installments. If the hryvnia-dollar exchange rate further widens, mass loan defaults are inevitable, according to Yuriy Belinsky, head analyst at Astrum Investment Management. At the current Hr 8 to the $1 rate, â€œ40 percent wonâ€™t be able to pay their loans,â€ Belinsky told Korrespondent, a Russian-language Ukraine newspaper. And the situation is deteriorating fast, a quick visit to the foreclosure sections on the websites of banks like Finance and Credit Bank or Alfa will turn up plenty of property and cars already listed for sale or soon to be auctioned. But given the slump in the real estate market and falling house prices it isn’t clear that banks will find it any too easy unloading any property they do repossess. We are back to the “you owe them a little money and you have a problem, and you owe them a lot of money and they have a problem” situation. Last weekend, the NBU also recommended that banks lower interest rates on foreign-currency denominated loans, but the problem is going to be, as ever, who is actually going to fund these measures? The Bank take the view that the Ukraine government – in agreeing to the terms of the IMF loan package – have initiated an important programme of macroeconomic adjustment measures, but (with a wary eye on what is actually going on in the Parliament) stress that consistent implementation is essential to avoid a further erosion of market confidence. In their latest report the Bank highlight the shift towards a flexible exchange rate policy, financial sector stabilisation measures , and a more conservative fiscal policy, but as we have seen, these are just the measures which seem to be being challenged by some of the political participants . One of the reasons why I think the IMF and the World Bank are taking such a big risk with their credibility in Eastern Europe at the moment, is that I don’t think they are getting through to the heart of the problem. One way of thinking about this is to take Paul Krugman’s favourite Keynes quote – “we’ve got magneto trouble” – and ask ourselves whether all we have before us in the CEE countires right now are magneto problems, or whether, to continue with the metaphor, we may not have issues with the cylinder head gasket. And it gets worse, because the cylinder head gasket does seem to have blown (and it will keep blowing) because we have leakage problems in the sump, and the main oil pump isn’t working – and who knows, maybe the crankshaft even needs replacing. As they always tell you when you take the car into a garage for “fixing”, we won’t know till we take the thing apart. What do I mean? To some extent it is worth stressing here that what really matters is the actual numbers of annual live births, rather than any more complex measure of fertility. 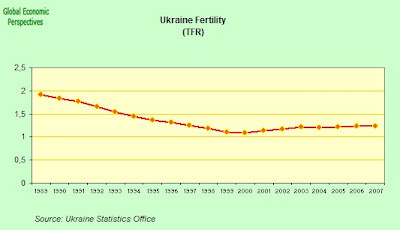 In 1989 for example there were nearly 700,000 children born in Ukraine. By 1998 this number was near to 400,000 (ie there was a drop of 40% or so in a decade). In practical terms (and if we take 18 as an average age for labour market entry in a country like Ukraine) next year there are potentially 650,000 people to enter the labour force, but by 2016 this number will be only 400,000. So it isn’t simply a question of pushing the fertility rate up towards the replacement rate (a difficult, but not impossible task), we also need to think about what economists term the “base effect” here, that is that with each passing year and cohort you have less and less women in the childbearing ages, so even if those women replace themselves, the base of the pyramid is still much narrower than the top, and it is the people at the top who need caring for and financing. And even if some of this loss can be offset at the workforce level by increasing labour force participation at the older ages, we would still be talking about a very sharp rise in the average age of the workforce. And productivity improvement alone cannot possibly hope to compensate for the kind of labour force contraction we should reasonably expect, at least not over such a short period of time it can’t. So this is just one more reason why, against all expectation, fertility really does matter. While many continue to believe that falling populations don’t actually have any tangible impact on economic performance, it is very striking to notice that when it comes to ageing and declining populations we really lack ANY evidence to substantiate that claim in the affirmative. On the other hand we do have plenty of evidence from countries where the population is either falling or gathering negative momentum to suggest that these countries face some very special kinds of economic problems. The example of Eastern Europe is clear enough I would have thought, but people really do need to take a closer look at what has been happening in recent years in countries like Japan, Germany, Italy and Portugal. 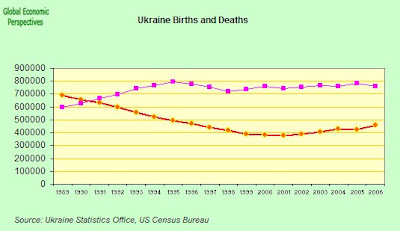 And if falling population does produce its own kind of economic problems, well then we should be expecting to see plenty of them in Ukraine, since as we can see in the chart below Ukraine’s population peaked in 1993, and has been in some sort of free-fall ever since. The second worry concerns the future of the country itself. 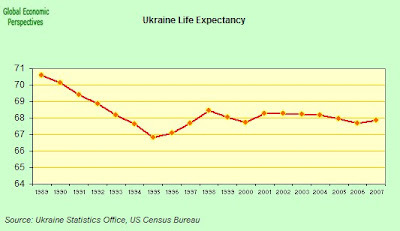 A recent study carried out jointly by the Kiev based Democratic Initiatives Foundation and Nova Doba History and Social Sciences Teachers Association found that while more than 93 percent of the Ukrainian seventeen year olds they inteviewed considered themselves Ukraine citizens, only 45 percent said they planned to live and work only in Ukraine, citing Western Europe, Russia and the United States as possible future destinations. When 55% of your potential future labour force are thinking of working elsewhere you have a problem, and one which needs a solution. Simply putting a strip of band-aid over a festering wound won’t work, I’m afraid, however much the Ukrainian people may struggle and sacrifice. With or without Keynes, we’ve got more than magneto problems on our hands here. 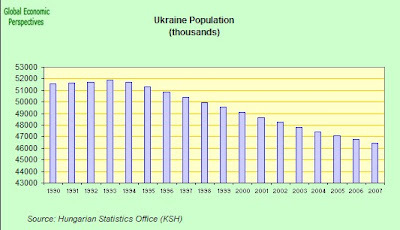 A much fuller analysis of the problems presented by Ukraine’s long term population implosion (including the issue of out-migration patterns and trends) can be found in this post here. why would a declining population trigger inflation? if i look at japan it’s the opposite. in fact why would fertility have any impact on inflation? I agree with the previous comment, the direct connection between fertility/death rate and inflation seems rather dubious. No problem could take so much paper to explain.Perhaps we are not getting to the bottom of the problem whatever it is.Why do we insist on seeing the world as different countries instead of brothers living in the same world? Since the capitalist system has failed us so miserably maybe we should give the socialist system (as in Sweden)another try.Are the bankers of the world going to tell us now how to handle money?That is insulting to the rest of the world. Very interesting article fnd useful information about Ukraine. However, I don’t understand – why “Australia” in the title? This I think is a generationally specific joke. It refers to a film with Jane Fonda and Jack Lemon, which was about the Three Mile Island nuclear power station crisis. The idea was that if the core started to melt it would go straight through the earth’s core and come out in China. Australia just seems to be more “antipodeian” in the Ukraine case (although my geography may be way out here). Their is also possibly a rather unfortunate secondary reference to Chernobyl. The idea is thus melt-down, but without repeating and repeating the same expression. I think Krugman got the joke anyway :). OK, I will try and find the time for Andy’s more serious question (and your one yesterday Mike) late this afternoon. So just check back. The think here is the basic difficulty with what is normally known as the neo classical theory of steady state growth. The basic idea is that any economy has some sort of near constant capacity that it can grow at, and policy is geared to trying to tune any given economy to its “trend rate”. The thing is the only economy I know that really conforms to that picture is the US one, and there may be good reasons which can be adduced to explain this. The normal pattern, as we saw in Japan in the fiftees, or Italy in the 60s, or China now, and India in the next decade I’ll wager, is that economies as they develop attain very high growth rates. There is a generaally accepted (among economists I mean) explanation for this, in that as fertility drops a higher and higher percentage of the population eneter the working age groups, and then a higher and higher percentage of these enter the most productive ages (normally thought to be 35 to 50), thus the normal development of an economy passes through a largely labour intensive growth stage, and then a drive for quality and productivity catch up stage. Then, normally, economies enter the so called “steady state” period where growth is in the 2 to 3% range. This is more or less normal growth. But as we are now seeing, the story doesn’t end there, since as societies age further then the so called trend growth falls and falls, Think of Japan’s “lost decade” or Germany between 1995 and 2005 when growth hovered around the 1% annual mark, or Italy, where the decade average growth has dropped from around 5% in the 1960s to the zero percent we now have. Evidently some of these economies can now begin to contract as population declines. Well, that is more or less the theoretical background. 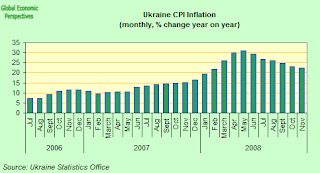 So why do we get inflation in the ex communist societies – since I think more than the CEE is involved here, we have Vietnam, and we will have China, I mean we were already seeing the first signs in China earlier this year with the surge in inflation before the global crash put a stop to everything. Basically, it is to do with the catch up growth process. The CEE economies have all been trying to grow, not at 2-3%, but at much higher levels, and this is where you hit the capacity problem and the inflation. The only country which didn’t quite get there in my book was Poland, and again they simply didn’t have time, before they were hit in September by the credit crunch. But all the rest had wages going up towards the roof (oh, I know the explanation is that they were poor, and that they needed to catch up in their living standards, and in this I agree, but as we are now seeing, you need productivity improvements to do this, and if you try and get there without those, then you simply get a boom-bust, which as we are seeing before our eyes is a real tragedy). So the demographica argument is that you need a labour intensive stage to have this rapid development, and you can’t have this labour intensive stage without “thick” cohorts at the base of the pyramid to enter and do the work. Basically, I had long been expecting something like this, but I was really shocked in mid 2007 to see just how dramatic the whole thing was in the Baltics. I open several blogs to follow events, and more or less we have seen what I was suggesting take place. I mean, I’m not saying that I was 100% right or anything, but just that I was scratching around in the right area, and you go back and look, just how many people in 2007 were saying that Esat Europe would end up at the centre of the global crisis. I was. Straight after the sub prime thing broke out. I also quickly had my finger on Spain, but that is another story. Well Japan now becomes quite important, since if I am right a lot of CEE countries will now follow the Japan (or German) road, and have very low inflation (or even outright deflation) since this is the bust side of the boom-bust. But then we need to think about consumption (demand side) and not production/labour supply (supply side) dynamics. Basically fertility regulates the median age of a society, and median age regulates borrowing and saving patterns. These societies have largely been huge borrowers (CA deficits) and now will become net savers (CA surpluses). I think there is no other way. Domestic demand is now done, and we are moving over to export driven economies. But this means structural demand insufficiency internally, and hence a downward pressure on prices. I know this is all hellishly complicated. It took me years to get to grips with it myself. It’s a bit like the theory that global warming can very easily lead to a new ice age, in both cases substantial non linear processes are involved. But why should fertility matyter to economics? Well as I say, it regulates long term labour supply, and it influences savings supply via the impact on median ages and the life cycle behavioural patterns. It’s as simple, or as difficult, as that. Basically because, due to the very special mix of economic and social development they had, they all passed through the first half of the demographic transition – moving over to lowest low fertility – before they got the modern economic growth regime part. So they have been trying to run on one leg, as it were. Thirty years of Chinese one child per family policy is a bit like climbing a tree, sitting on a branch, and then sawing the branch off. There’s an interesting compare and contrast with Latvia. Why did the Fund agree to a fixed exchange program for Latvia but flexible for Ukraine. Someone in favour of the Latvia approach could look at Ukraine and say: see what happens if you try flexible exchange rate with recession — the floor drops out of the exchange rate and you have neither monetary stability or growth. At least Latvia has one. I say this as Devil’s Advovate, not because I agree with it (necessaril). Thanks for the article. It is very informative on what is a very interesting developing situation. Do you think that the conditions imposed by the IMF, such as restricting the size of the budget deficit, are making the crisis worse? Well…. not really. I mean, there would be good grounds for greater flexibility (accumulated debt to GDP is only 12%) if the political system could be trusted to act responsibly. But that is just the tragedy, they can’t. Give these people and inch and they will take a mile, it seems to me. So money could just disappear in populist and demagogic spending – in this sense Ukraine is more like Argentina than Latvia is – without addressing the underlying problems which have produced the mess, which means in particular having an independent central bank able to apply serious monetary policy, and as we can see at the moment, one faction wants to put the Governor of the Bank in prison. My guess is that some people in the fund must have been tempted to simply walk away and leave them to it, but that would have been irresponsible, since the contagion risk is huge, and even the risk of the country breaking up is non negligable. I think the IMF have little to gain, and everything to lose here, so in this sense I stand side by side with them for trying to do the best they can under difficult circumstances. Even though, as you will see in the Latvian case, I am far from being unwilling to criticise the IMF when there are what I consider to be good grounds. Basically, if the IMF hadn’t moved in this country would have already fallen apart, it is as bad as that. Thanks for your response. The reason that I asked is that it seems that with the Ukraine heading deep into a recession, it would make sense for the country to have a fiscal deficit, even if this would not help public finances. Imposing a balanced budget would create significant risks of a much deeper recession. I agree that there are governance problems, but I don’t see that the IMF has any potential to address this issue, except perhaps with regards to the central bank. It will take an election to resolve the power struggle between Timoshenko and Yushenko. I notice from news reports that the parliament has passed Timoshenko’s budget, which will be in a deficit. It will be interesting to see what happens next. I don’t know how much pork there is in the budget — hopefully not as much as we usually get down here in Australia! Obviously I agree, and especially with interest rates at 22% to protect the currency. There is simply nothing to stimulate the economy.But we are where we are, and I think we both agree there isn’t much the IMF can do about the governance issue. Basically I think people are paying brinkmanship with the IMF, and then they just get into a horrible amount of moral hazard. In other words a projected 3% deficit is going to be much higher, but even this wouldn’t matter if they had a programme which was going to do something to put the country’s economy on a better footing. But I think what we have here isn’t so much pork (although I imagine there is that) as bread and circuses. The head of parliament’s budget committee, Mykola Derkach, acknowledged that the budget was “very optimistic. But we must adopt the budget. It is a step in overcoming the crisis.” An aide to President Viktor Yushchenko, Oleksander Shlapak, said this week new talks with the IMF would now be needed. “I cannot say how they will end, but think that the chances of winning them over are 50-50,” he said. The danger here is that the IMF, instead of being proactive, simply gets pushed and pushed by the pressure of public opinion and the scale of the problem. Again, you could ask whether there isn’t brinksmanship going on with the gas crisis, and that they don’t simply want the IMF to lend the money to pay the debt. Very hard to say. But what I am saying is, give some of these people an inch and they will take a mile, not a yard. I would say there were two reasons, an arm twist one (a lot of political pressure, Ukraine has few friends, and indeed some powerful enemies), and Latvia has the possibility of euro membership, in which case the currency would be effectively pegged anyway. The question is only – at which level are you going to peg it. Indeed with Latvia being so small, and her friends so big, I don’t think it would have been hard to steer the currency down to a new lower level and hold it there. In the Ukraine case this is much harder. First off the inflation was (even) bigger, and secondly, whatever the issues with the Latvian political and institutional system, it is way above the Ukraine one. I may disagree with the Governor of the Bank of Latvia (over the peg), but I think he has a legitimate point of view, and is a completely credible individual. Ukraine is simply “another country” in all of this. Basically, I do think the IMF are sometimes a bit “wooden”, they swallowed the “we need to raise wages” argument too easily for too long, IMHO (this is to say they let their hearts rule their heads, which is not the typical critique of the IMF I don’t think), and then once they finally got round to pushing for bugdet surpluses (which were needed during the boom), they have not been able to move quickly enough away from this idea in the face of the severity of the downturn. Generally the stock of debt is low in Eastern Europe, and this does give them some small room for manoeuvre, provided you get the institutional and structural side right to go with this. 1) On the longer term, I think you need to extend your theory to assess that human labour has never been less valuable. Most modern economies have been balanced by a huge wave of underemployment. “Productivity” has massively outstripped the ability of our unequal world to develop demand. There are lots of people who need more material things, but not only don’t have the money to buy them, there’s no way in the current system that they will foresee-ably ever have that money. You can’t help but wonder if some of these intermediate countries (Ukraine?) are destined long term (like much of East Germany?) to be either forest or farmland, with a few provincial cities dotted around. Need, or want. I say this because I myself am not especially materialist, and don’t miss a lot of the things that many people tell me they “need”. On the other hand I value time, and autonomy. I’m certainly not an admirer, but Milton Friedman would have called this “personal tastes and preferences”, a realm which the non normative economist is forbidden to enter. To be clear, I am certainly not saying that in a poor country like Ukraine, there aren’t lots of people, especially old people and young children who lack primary necessities, and especially access to good quality basic health care. I also just wrote this morning about 700 migrants in the Spanish village of Ubeda, who are having to sleep in the municipal sports centre and eat at “Caritas” soup kitchens, since they have been displaced by the housing crisis. So there are certainly plenty of people in real “need” in this world, but I doubt that too many of these are young people in Western Europe between the ages of 20 and 35, and I think we might all do well to ask ourselves just how many of these material objects we really do need. If all people thought like I do, then there would be a problem. That being said, the argument you are advancing here is a variety of what is known as “underconsumptionism”, and was very much in vogue in the 1930s, which is just one more reason why I think we are about to revisit “depression economics”, since all the old arguments are simply going to come up again. I don’t ,incidentally, agree with “underconsumptionism”, since I think that falling prices do normally correct these kind of imbalances in the economic system – ie the value of supply contracts to meet available demand – but this is just another reason why I think that the tone of the next decade may be more deflationary than inflationary. Yeah, and populated by increasing numbers of wolves. I disagree with you on demographic issues. While a falling population will undoubtedly result in falling GDP, it can result in increasing PER CAPITA GDP. The best example of this is, of course, the black death of 14th century. For the average European, the result was increased labor mobility and standard of living, though those at the top of the pyramid generally were worse off, which is why laws were (unsuccessfully, in Western Europe) passed in an attempt to restrict wages. 1. Great analysis on a very complicated situation, congratulations! 2. You keep using “the Ukraine”, should we use “the France”? or “the Japan”? 3. Underground economy is huge……will it mitigate economic collapse? 4. Will the recovery of global industrial and soft commodities(agricultural) improve the economic situation? I was in Ukraine in June working on over $500 Million of orders for Australia and China. Being Australian I had to get the visa renewed in Latvia to go again. But the Ukraine embassy in Riga decided that my sponsor was not good enough and I had to send my passport to the Ukraine embassy in Australia for renewal. Meanwhile my business partner managed to get deals via Russia. I would like to add that driving through Ukraine discourages investors as the Police are incredibly corrupt with false breathalysers and threats on drug tests. People are the resource that can save Ukraine economically and Ukrainian people are the cause as to why Ukraine struggles. Don’t worry about disagreeing with me, lots of people do. Well look, could we have a more recent example, we are in the middle of a major demographic transition where the age structure of lots of countries is going to change while their populations shrink. I don’t think we need go all thje way back to interpretations of what happend back then (when incidentally population rebound was homestatic – which is the flaw in the Livi Bacci argument, which as it happens you are using, though you may be unaware of it. Since he is a great demographer you are in good company, even if I disagree with the way both of you would use the black death episode). What I am saying (I think) is that in the BD case you have dramatic population decline in a high fertility enviroment, while what we have here is log term population ageing (I mean no population pyramid in any society has ever looked like our modern ones do, so I think people need to be very careful about arguing from “experience”). Basically if we look at 6 modern societies, and put them into two groups – Italy, Japan and Germany – on the one hand – the US, the UK and Framce on the other. What we find is that populations in the first group are now stagnating, while in the second group they are still growing relatively robustly. What this means is that the pyramids are inverting more slowly in the second case, and more moderate change is ALWAYS in my book better than the more drastic variety when it comes to processes like this. Now, when we come to compare GDP per capita between the two groups using Eurostat Purchasing Power Standards (for relative comparisons) we find that GDP PER CAPITA is growing much more strongly in those with a higher percentage of younger people (ie the UK, the US and France) rather then in the older group. I find it perfectly obvious that this should be the case, but many economists seem to have great difficulty coming to grips with all this. At the present time we can only speak of slower GDP PER Capita growth, but all of this is now only starting. Italy is the first large economy to have GDP skirting the GDP growth zero bound, and realistically we can see GDP shrinkage begining in all three between now and 2020. When GDP contraction turns into GDP per capita contraction I don’t know, there are lots of factors involved, but the theoretical possibility is there. We will only know when it does or doesn’t happen, which should be between 2020 and 2030 as far as I can see. I may be right, or I may be wrong, we’ll only really know when we get there. But are you happy to take the risk solely on the basis of what you know about the Black Death, since the risk is real, and if we let things degenerate to that point, then realistically for the societies involved there will be no turning back, since systematic melt down gets inbuilt. Sorry, my mistakes, writing to fast or whatever. Basically no, since for what matters here it doesn’t exist. You can’t bail out a banking system with taxes from the informal economy, since by definition the informal economy doesn’t pay them. Access to the informal economy may help people get through the hard times better, but that is a different issue. For the economy to be stable they need to incorporate the underground economy into the official one, but during a crisis like this the danger is that things move in the opposite direction. Of course, especially after the devaluation of the currency. But when will this recovery come? This is the problem. Not quickly and probably not this year (2009). Maybe better to talk about this in January 2010, but there’s a long hard road for Ukraine between now and then. Thanks for your insightful artical. Ukraine has been inflicted with political instability ever since its declared independence., It has also been involved in a struggle to adopt a European parliamentary style democracy, something that Yushchenko has been opposed to. The latest fall in the value of the hrivina does appear to be artificially controlled. The property market has boomed beyond sustainability and reach of the Ukrainian population and average income. A boom bust cycle is unavoidable. Ukraine has only recently been seduced by the accessible level of credit Unlike the 1998 bust it has not had to undergo major bank foreclosures. Banks in Ukraine are highly capital geared and in many cases hold more value in assets then in liquidity. If the loss of confidence and over inflation and devaluation of the hrivina creates a run on the banks some banks might take flight with assets and investments disappearing overnight. Ukraine does not have a strong regulatory enforcement system in place to deal with opportunistic lending practices or asset redemption. It is in effect a tinder box likely to ignite. What needs to be look at is the comaritive indicators for neighboring states and economies. Ukraine appears to be more worst off then it’s neighbors, which begs the question why? to what extent did the political instability and threat of another round of parliamentary elections fueled the current crisis. It is difficult to see how fresh parliamentary election would resolve, only exacerbate Ukraine’s political instability. Most of the problems associated with Political instability are due primarily to the office of the President, According to recent public opinon polls by Viktor Yushchenko maintains 4% of public support. If fresh election are seen as a possible pressure release value then early Presidential elections are the better option. better still would be for Ukraine to adopt a European style parliamentary system of governance bringing it in line with other European states. Ukraine has foundered under Viktor Yushchenko’s rule. Opportunity lost with effort and time wasted on trivial infighting between the Office of the President and the parliament. Yushenko has sought to dismiss two parliaments and hold three elections under his termof office. 2007 saw Ukraine embroiled in conflict for nine months, in what was clearly an unconstitutional power grab by the President who further undermined Ukraine’s democratic development by illegally interfering in the independence of Ukraine judiciary. The President’s attempt to further undermine Ukraine political instability in 2008 has only exacerbated Ukraine’s problems and fueled the loss of confidence. The reformation of the governing coalition last month has added further concern as to the ineffectiveness of Yushchenko’s role as head of state. Yushchenko is unlikely to win a second term of office should have resigned by now and handed over the role of head of state to someone else. The sooner Yushchenko is removed from office the sooner Ukraine hopefully, can begin to rebuild a democratic economy. Of course replacing Yushchenko will not resolve all of Ukraine’s problems BUT it would go a long way towards reuniting a county that has suffered the negative consequences of his polices of division and destableization.